Platinum Motorcycles is a small, one man operation which opened its doors in 2009. Mark has specialised in BMW motorcycles for 12 years due to a pure love for the brand, their technology, their history and future plans. Mark has been trained by BMW to the highest level, to give him the know how and the ability to give your bike exactly what it needs. The high standard of service and equipment at Platinum Motorcycle’s workshop means you can be assured you will receive nothing but the best quality when it comes to maintenance of your pride and joy. 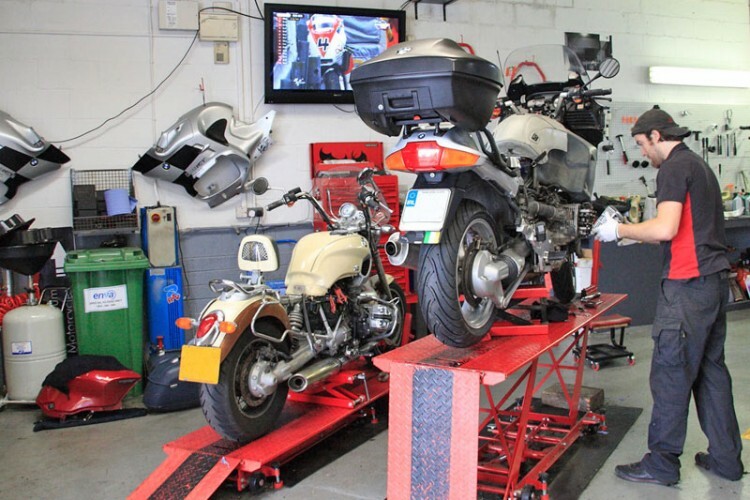 Stocked with genuine BMW Parts, a large quantity of tyres to suit a wide range of BMW motorcycles and as we only use the best for your motorcycle. The high standard of service and equipment at Platinum Motorcycle’s workshop means you can be assured you will receive nothing but the best quality when it comes to maintenance of your pride and joy. We pride ourselves on only using top of the range tools and equipment including full machinery to change and balance your tyres/wheels with our precision wheel balancer. We also have a range of paddock stands to suit your bike which may only have a side stand.